Dior Homme Sport will get a worldwide launch and with its release, perfumer François Demachy “was aiming for a simple structure composed around ginger". I feel he succeeded on both counts: Dior Homme is an uncomplicated fragrance (as sport fragrances should be) and it possesses a steady stream of ginger from top to bottom. Besides ginger, Demachy included citron, bergamot, grapefruit, rosemary, lavender, elemi, cedar, vetiver and sandalwood in Dior Homme Sport’s formula. Dior Homme Sport opens with sharp ginger and opaque citrus, next comes barber-shop lavender (with touches of vanilla and rosemary) and then we go straight to the base notes: an interesting “ginger oatmeal” accord and sour citrus “candy.” Dior Homme Sport can smell a bit sharp up close and no development stage of Dior Homme Sport lasts longer than a few minutes — quickly, you smell the fragrance whole (it’s the perfume equivalent of watching a simple puzzle being put together on film, in fast-forward mode: Top! Middle! Base! DONE!) All that said, Dior Homme Sport smells nice: clean and fresh with a few fleeting notes of interest. Dior Homme Sport is less obnoxious than the majority of sport fragrances on the shelves right now, and if I were ordered to wear a sport fragrance, this might be the one I’d choose. Dior Homme Sport has average-to-weak lasting power and well-mannered sillage; it’s currently exclusively to Sephora in 50 ($50) and 100 ml ($70) Eau de Toilette. While I like Dior Homme, I am near anosmic to some aspect of it ( I sense that there is more going on than I can smell, if that makes sense), I adore ginger. I am going run out and smell this one. I need something that fills the ginger-scented hole that au Gingembre didn't quite fill. If you like ginger, smell Escada Sunset Heat for men before it's sold through and discontinued. Reminds me of a famous Michigan gingerale: “Vernors”. Marlo734: ah, the scent of gingerale is great, but I never come across any men's Escada scents! I LOVE Vernor's!!!! I will have to find some of this…. You're not missing anything. Except for the original Escada Homme, which is pretty good, and the discontinued Casual Friday, which was fantastic, there's not much to be said about them. If you like the smell of gingerale, then you absolutely have to try Demeter Gingerale. Trust me; just buy a bottle of it. The full size: why not? You will not regret this. It smells carbonated; it actually has a fizz to it, and it will make you laugh out loud. No lasting power, but you can just keep spraying yourself into a state of bliss. I got a tester of this the other day and tried it out. I haven't quite made up my mind about it yet, but at least it smells different to most mainstream men's fragrances, and definitely doesn't smell like the usual “sport” versions. It's probably the ginger, but it really does smell very vibrant and perky. Not at all generic to my nose anyway. I found the lasting power to be quite weak, but the silage wasn't bad at all. I could smell it quite strongly for about 3 or 4 hours, but then it was prettu much gone. It totally disappears. Perhaps it's better sprayed on clothing. Overall I do really like it though. It's stands out from the usual stuff. Riverwide: I do think the ginger saved this…and the absence of those STRONG ozone/marine notes you get in most sport stuff. i smelled dior homme cologne in the duty free shop in LAX….maybe available in another major international airport? its like a mega light version of the original plus orange blossom – literally how it is described. Hi Kevin! Great review about DHSport. I've the DH trilogy, and I'd put then in the sequence of iris amount: DH Cologne, DH and DH Intense. Cologne is the one that has the largest amount of iris of the three. It's starts very citrus and shiny, and the citrus opening is followed by almost a double charge of iris that DH has. It's great for summer, it has a citrus cologne thing without having the gourmand notes that the development of DH have. On the other side, DH Intense almost don't have iris. At the first fifteen minutes of it's application, it's almost equal to DH, but when it begins to develop, DH Intense turns fine woody gourmand, with a white chocolate sensation. It's creamy gourmand, and sometimes it remind's me of the almond gourmand thing on Bois d'Armenie. Yes! That's what I was trying(and failing) to say. The generic marine notes aren't there at all, which is a nice surprise. This sound kinda good to me, although my husband has banned men's fragrances for me (I know, not fair!) But more importantly — is that Jude Law in the advert? He looks pretty damned good. Thanks for introducing us to a new scent. Have you tried Roger & Gallet's Eau de Gingembre? Based on your review, I fancy you'll enjoy it. It is a high quality cologne and sells for about $ 25 for the 6.8 oz. package to boot! That's what I was about to ask! Is that Jude Law? Squirrelmilk: I'll look for it next time I'm in duty free then…but if it's even lighter than Dior Homme! HB: thanks…DH Cologne sounds like I'd appreciate it! KD: yes, march from perfume posse suggested Eau de Gingembre to me awhile back when I reviewed the Serge Lutens 5 o'clock scent and I DO love it…even got it in soap form. That's very unfair, and I hope you negotiated something good in trade. And I concur that Jude Law is pretty striking in that shot. I know no one will believe this, but my comment verification code is “sex34”. 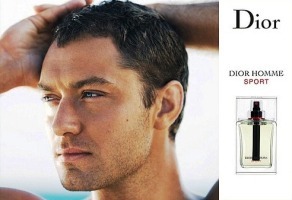 I remember us all whining about the fact that, in the original “new fragrance” announcement, there wasn't the add copy with Jude Law. As for the fragrance, I would love to smell it. I have a deep fondness for ginger, although I haven't smelled it much in perfumes. Any man who could wear ginger…well, he would probably make me very happy indeed. As a Michigan girl, myself, I comment on the sad reformulation of Vernor's ginger ale. It is but a shadow of its former self. Since they removed the Stevia in 1991 and replaced it with the dreaded High Fructose Corn Syrup, and sold the company to Schweppes, it's lost its kick. It used to be very biting, more like ginger beer, and your nose would itch just from smelling it! Now it is just another bland, watery Schweppes “ginger ale” product… barely discernable from tonic water. Oh, Kevin, I wish it were a parody! But, no, it is not what it used to be. Not even close. Lots of us Michiganders stopped drinking it altogether after its reformulation. It's silly to say this, but it's too hard to remember what it was, and drink what it is. Bloody FDA yanking artificial sweeteners from the market! I was surprised this actually wore for quite a long time on my skin – well over eight hours and across two time zones and a continent on a plane. I could still smell it on me without sniffing my skin, and I'm still undecided whether I like the end stage of the fragrance: I'd catch a whiff of something and try to find out who I was smelling it on, before realising it was DHS on me. I have tried and had Dior Homme, Dior Homme Intense and Dior Homme Cologne. Dior Homme is a powdery, flowery fragrance, that reminds of carrots. It also smells a lot like iris. It lasts long enough, yet becomes somewhat soapy. As for Dior Homme Intense – it is a heavier one and reminds you of some older Guerlain fragrances for men, with sweet metallic and wooden notes. Dior Homme Cologne is all the above in a citrus remix, lighter and less interesting. The Dior Homme line is not a masterpiece, however the design and the advertising campaign appeal to a refined reserved taste. I knew this wouldn't suit me personally, though I liked the ginger at first. My brother currently wears this often, so it's around a lot. Now it's almost repulsive. Maybe it's just boring me out of my mind. Could this be possible? The opening is still fine, but after a few hours of being around this scent I just wanted to collapse. Not that great at all. If you like ginger, Sunset Heat, Bulgari Blu and YSL Homme as well as Fuel for Life by Diesel are better choices as far as price goes, but Dior always gives you the aura of class. It is instant happiness to me! All my girls loved it. Hi Kevin! Not sure if you’ll read this but I smelt this again recently and am all but convinced it’s been reformulated – and I don’t think for the better… Would you mind re-sniffing the next time you’re out and about and happen upon a Dior counter?